I have been renovating my laundry room since about mid-September. I started with a general idea of how I wanted the room to look, but I like to work slow and live in a space as I make it over so I can get a feel for what I really want. It was uninspiring and lacked any flow or function. At the end of the room was a large square space that was awkward. I had a shelf in there for awhile and I tried to make it useful by hanging some coat hooks and adding a chalk board. In reality, it was the dumping spot for anything in the house that we didn’t want to put away. In the last several months I’ve added built in shelves and a bench to give it a mud room vibe and also added lots of pretty beadboard and trim. I’ve been using the room the entire time I’ve been working on it so it’s given me a chance to really get a feel for what I need in there versus what will just look pretty. Because this room has multiple purposes (it’s a mud room and a laundry room) it needs to be organized, flow well, and be functional. For the last two months I’ve really gotten a feel how this room will function and I’ve figured out what else the room needs to make it work better for me. I was planning on hanging some pretty art above the washer and dryer, but after actually doing laundry in here for a few months, I’ve come to the conclusion that I need more sorting and storage space. I use to always take the clean laundry into my bedroom to fold, but after two years I know myself well enough to know that it will all end up in a heap on my floor and will take a week or more to actually get folded. This system obviously wasn’t working for me. Now that the laundry room is almost done I’ve been folding laundry on top of the washer and dryer as it comes out of the dryer. I much prefer to do laundry this way and it gets folded and put away much faster now. What I have realized though is that I need somewhere to hang all the clothes that go on hangers as they come out of the dryer. Otherwise, guess what? They end up in a pile on my floor waiting for hangers. I got out my tools and added a clothes rod and a shelf for additional storage. It is so nice to do laundry now. I fold most of it and hang up the rest. When I’m done, I can easily grab the entire rod of clothes on hangers and go put them all away at once. Laundry has become a breeze for me. I use to hate doing laundry because it was so hard to get it all put away, but now it’s much easier for me to stay on top of it. 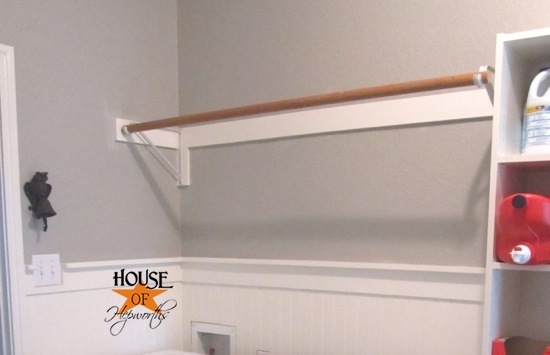 Here’s how I easily turned a blank wall into a clothes rod and storage shelf. 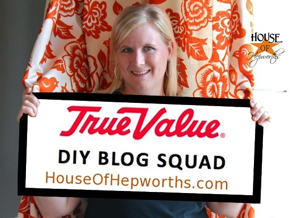 I headed over to True Value to pick up all my supplies. 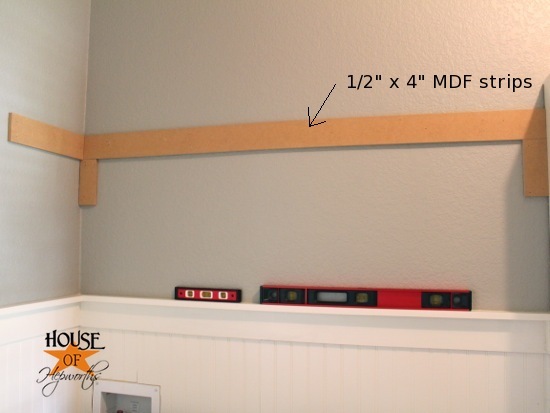 I started by using Liquid Nails to attach some MDF planks to the wall (make sure they are level!). Then I used my nail gun to reinforce them. Then I puttied up all the nail holes with wood filler. When you are working with MDF don’t use spackle for your nail holes. It’s too wet and will cause the MDF to swell. Wood filler is a better option. I also used white paintable caulk around all the seams to give it a finished look. After that I primed and painted everything. Next I added my rod brackets. These triangle shaped ones are great for holding a wooden rod as well as supporting the weight of the hangers and the shelf on top. I used screws to secure the rod brackets into the strips of MDF. I wanted them spaced as far apart as possible so the hangers would be able to slide up and down the entire rod without getting blocked by the brackets. After that I just cut a wooden rod the length I needed and attached it to the rod brackets with some screws. From there I cut an 11″ wide piece of wood the appropriate length to fit and attached it on top of the rod brackets. The MDF strips along the back and sides provide additional support. Now when I do laundry, I gather up hangers, head to the laundry room, and hang all the clothes as they come out of the dryer. Then I carry the entire stack straight to the appropriate bedroom and hang them all up. No more piles of wrinkled unfolded clothes all over my bedroom floor. Plus the shelf on top will provide additional storage for seasonal items (like beach towels) and all my extra laundry baskets when they aren’t in use. Totally practical and functional and it really finishes off the space and makes it look complete. Dare I say I might actually even enjoy doing laundry now? Who would have thought. And I think it’s safe to say that the laundry room is quickly becoming my favorite space in this house. Your laundry room redo got my brain in motion and I recently topped my stackable, but unstacked washer and dryer with a “countertop”, on the cheap. Mdf was going to run $40, so instead I found a undrilled plain door($20), cut to size , and painted and I have a solid surface countertop – no more fear of falling items between machines. 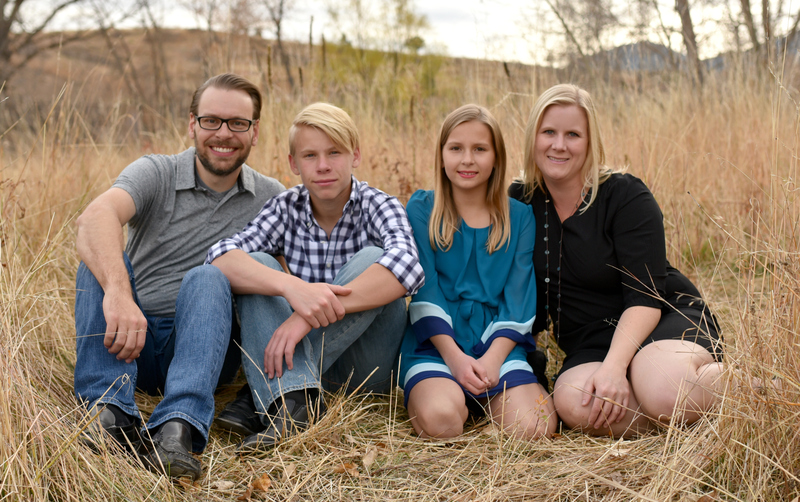 Thanks for jump starting me into a better space…more work to do, really enjoying your blog. i love the clothes rod! 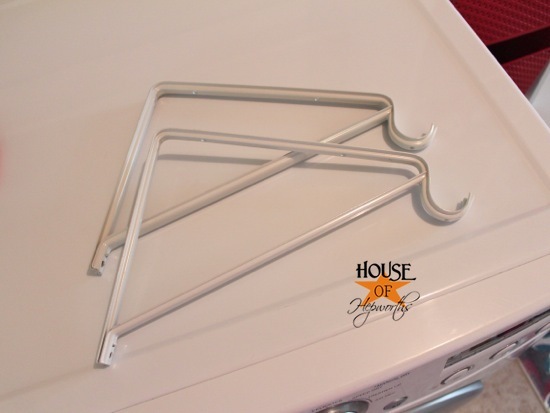 i have a wall of cabinets over my washer and dryer and they are front loading,too so i do have the top of then for folding clothes but it would be so nice to have something like you did for hanging. not that i would EVER EVER want to get rid of all the cabinets!! LOL i know what a blessing all that storage space is. 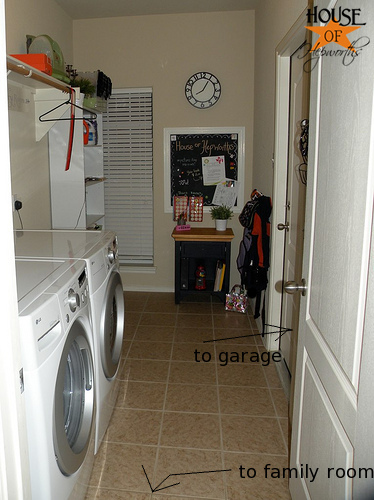 I’m planning a blog post about my laundry room too. My laundry room is in need of something! Should be a fun post. Your laundry update is great. 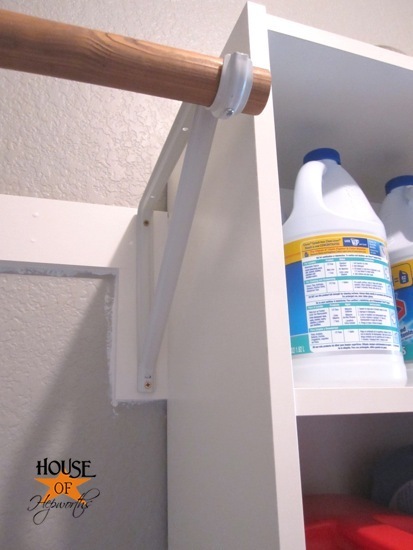 Something that can add even more space is a shelf over the doors. I use that shelf for things I rarely use but still need from time to time. Hope you enjoy your room as much as I enjoyed seeing your process of improvement! That looks great and I love how it’s so functional for you – what a perfect solution!! And I love the rug you have in there! I like it! 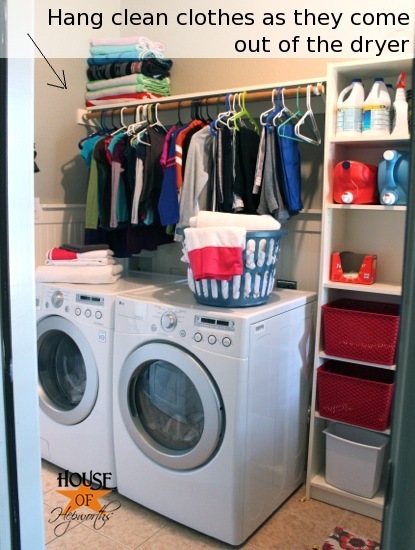 I have been slowing getting ideas for my laundry room as well. I love the rod idea! Thanks for your blog. I love reading it and adding your ideas in my home. If only you would come and actually implement your ideas in my home for me!! That could be your next job! Hi there, enjoy your blog. Something I do with my laundry is to color code the hangers. 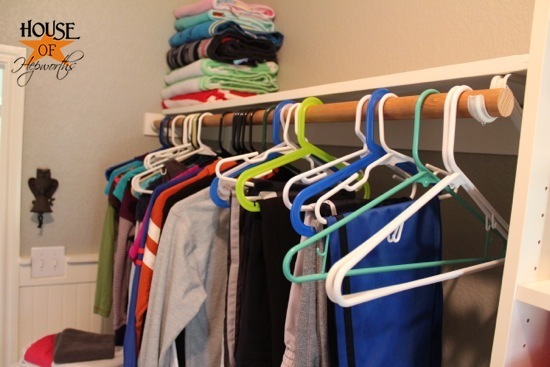 Each person has a different colored plastic hanger. That makes laundry dispersal quicker and easier. Laundry is so consuming with kids that organization is essential! Looks great! 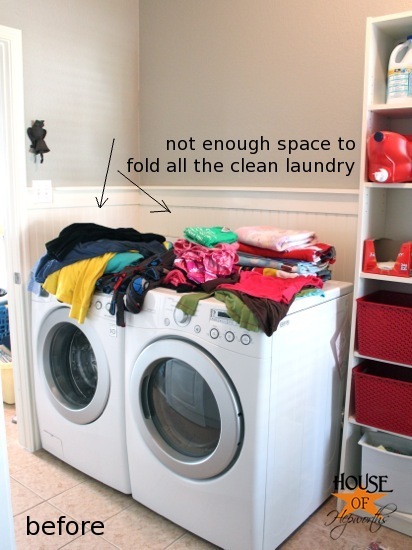 I just did the same thing in our laundry room, and I love it! Love your blog, have a great day! Awesome. Great job. And my word, I love your blog! Thanks for the link. I definitely added it to my reader. Hey Allison! Thank you so much, that means a lot coming from you! PS Thanks for the pin, too! I LOVE the Martha Steward Grey paint! We are painting our basement this weekend and I have been searching for a warm grey. Did you get it at ACE? You new space looks great! 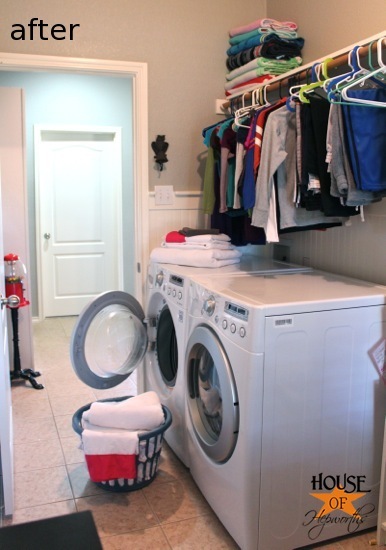 Clean and crisp…exactly how a laundry room should look! 🙂 Well done! I bought the Martha Stewart paint at Home Depot, but they don’t sell Martha anymore so you have to get it in Behr. 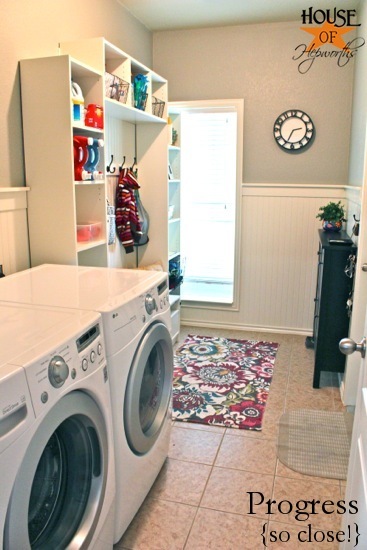 I seriously love your laundry room and all of the functionality and space you added! I cannot wait to redo mine one day!